Though starting out as a sculptor in his hometown Buenos Aires, David Lamelas’ practice acquired a more conceptual focus after he moved to London in 1968 (where he attended St. Martin´s School of Art), involving the appropriation of tools and techniques usually pertaining to mass media, particularly the television and film industries. He began to use film, photography, video and installations, in order to develop projects showing very personal notions of time, space and language, three subjects that permeate his entire oeuvre. In 1976 Lamelas made his home in Los Angeles, USA, where he has pursued a multidisciplinary practice questioning the boundaries of temporality in art, as well as art’s potential to create alternative communication processes. With a certain sense of humour, which does not deny conceptual rigour, he seeks to understand the specific characteristics of the artwork’s environment, as each location exerts a strong influence on the final configuration of the piece. Mira hacia dentro de ti [Look inside yourself] shows a structure closely resembling that of a canopy supported on its fundamental members, which demarcate a space and define boundaries between inside and outside, and public vs. public. Through this piece, Lamelas materialises a persistent concern guiding his sculptural practice, i.e., to produce forms with no physical volume. 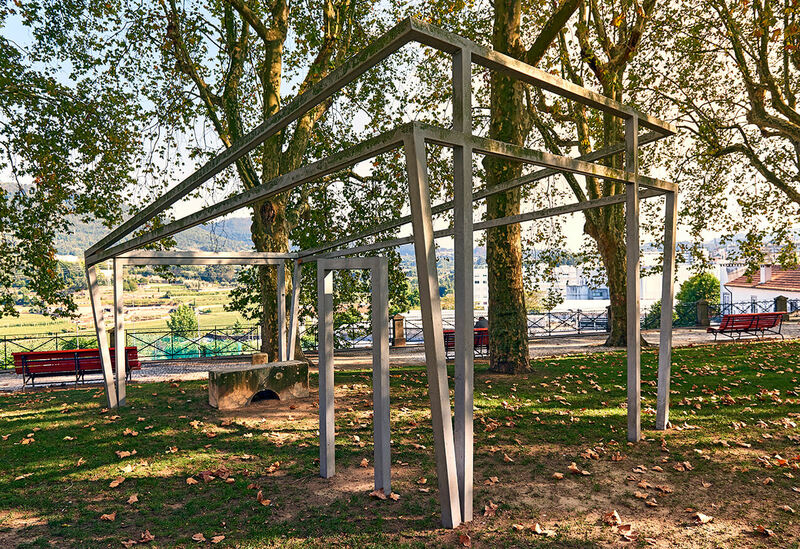 Thus, following this conceptual paradigm, the artist activates the empty space of the architectural structure and assigns it substance and physicality by means of its surrounding. On the other hand, the presence of a door invites viewers to inhabit a symbolic and introspective, rather than tangible, space.